Diapers.com has been around for a while. I'm sure you've seen their online banner ads... or their tv commercials... or their magazine ads. I know I've seen them all over the place. For some reason I never made an order. I have to say I DON'T KNOW WHAT I WAS THINKING!!! Diapers.com is quite awesome. What do they sell on diapers.com? Absolutely everything baby! Diapers and wipes, obviously. But they also have clothes, carseats, medication, toys and books, potty seats.... you name it... they've probably got it. They offer free 2 day shipping on orders over $49 and after doing some price comparisons it looks like their prices are pretty comparable or win out on most of the places I shop. Another feature on diapers.com is that once you register you can use the "reorder my stuff" link. They keep track of the things you order, so if you become a regular shopper it's very easy 1 click shopping from your list. Awesome feature for me! No need to browse and search!!! I go to my page and find the exact things I've already ordered. That is a huge benefit for me... since my browsing tends to mean higher spending. Now, to make Diapers.com even better... they've created Soap.com. One of their slogans says "diapers.com for baby, soap.com for you." They're not kidding. 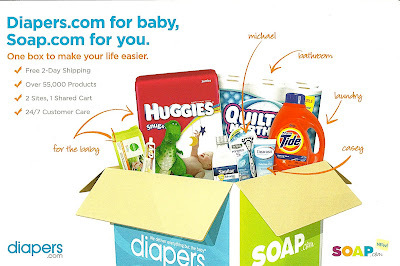 It really does look like "diapers.com delivers everything but the baby"... and then soap.com has a little bit of everything else. Their shopping categories include hair care, bath and body, medicine cabinet, vitamins, household, makeup, diet. The list just goes on and on. They carry everything from toilet paper to lipstick to breakfast bars. They also share a "shopping cart" with diapers.com... so the same free shipping deal applies. As part of their expo booth they type of "drawing". Each person that registered with their site got to pick out a coupon code. I was lucky enough to draw a card that game me "$20 + FREE SHIPPING". WooHoo!!! Free stuff. As a further reward... not only do I get to enjoy using the coupon code... I get to pass a bit of savings on to you. If you are interest in trying out Soap.com just click on over. If you find anything you're interested in purchasing enter the code BLOGHER2010. You'll receive 15% off your first order with Soap.com! -Free shipping on orders over $49. -Variety of products and major name brands. -24/7 help online and by phone. -I just made my first order... so I'm not sure how fast or slow the shipping is.